Is there is any place on earth where you can really speak of infinite love that a man can feel for his wife?, And it is part of the 7 wonders of the world is in India, more precisely Agra on the banks of the river Yamuna. This is the famous Palace Taj Mahal. The Taj Mahal, which means ‘The Palace of the Crown’ was listed as World Heritage by UNESCO in 1983 and ranked very recently, 7 July 2007 as the seventh most beautiful building in the world. Admittedly, this is a historical and architectural monument of inestimable value, but in reality it is much more than that. To find out, we must look back into history to discover its origins. The Taj Mahal is actually a mausoleum, not a palace. It was built from 1631 on the orders of Mughal Emperor Shah Jahan. 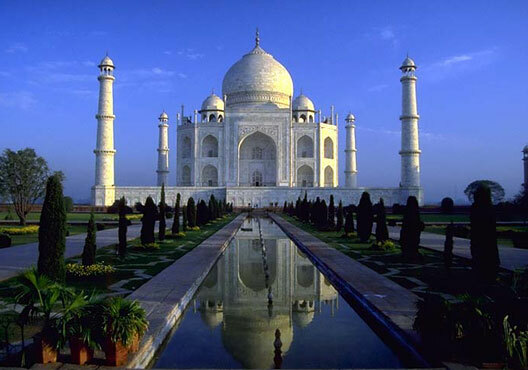 Saddened by the death of his second wife, Mumtaz Mahal the emperor decided to offer her the most lavish mausoleum ever built as proof of his love. However, because of his illness and disputes regarding his son's estate, construction slowed and even blocked. That is why the Taj Mahal was not completed until 20 years after the commencement of work. To discover the splendor of the Taj Mahal Palace, visit to northern, 200 km from New Delhi. The palace is built on a terrace of 7 meters high. Its courtyard is dominated by a magnificent garden compound symmetric lawn, fountain and stream. The central tomb is covered with a dome and surrounded on each side by 4 identical towers. At left, the emperor built a red sandstone mosque for meditation and sanctification. An exact replica of it was created right to maintain architectural symmetry of the place. Taj Mahal Palace is completely covered with white marble from Rajasthan, which changes color depending on time of day. Its walls are decorated with 28 kinds of semi-precious stones from around the world. In some places, you will find some verses of the Koran written in calligraphy on white marble. The Taj Mahal is the jewel of India, now a sacred place for pilgrims and a historic site not to be missed for tourists.